Para 2 a 3 jugadores de 10 años en adelante. The king encourages all barons to expand their domains as new land is conquered. To gain favor in his eyes, each baron must show his worth by constructing buildings and thus increase the splendor of the kingdom, or by supporting the king in the war with military units. With the king´s eyes fixed on the frontlines, he probably wouldn´t notice your sharp elbow in your neighbour´s side... right? Brawling Barons is a tactical card game consisting of 54 cards. 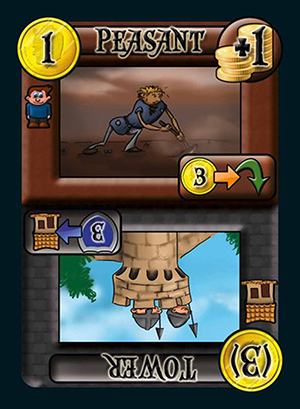 From this deck of cards each player draws cards and collects resources. Units (peasants and squires) can then be played from the hand. The peasants can be upgraded (rotated) to buildings, and squires can become various military units. The military units can be sent to the frontlines to gain victory points (VPs), or they can attack opposing towns. When the last card is removed from the deck, the game ends and VPs are counted. Tactical options include choosing units to play, waiting for the perfect timing to play them, optimizing the actions, and playing the right events. At first glance, it may seem too simple, but new depths can certainly be discovered. Brawling Barons can be played in 10-20 minutes by two experienced players. Three-player games take about 30 minutes. By combining two decks, up to six players can play, either in a deathmatch or in team play.